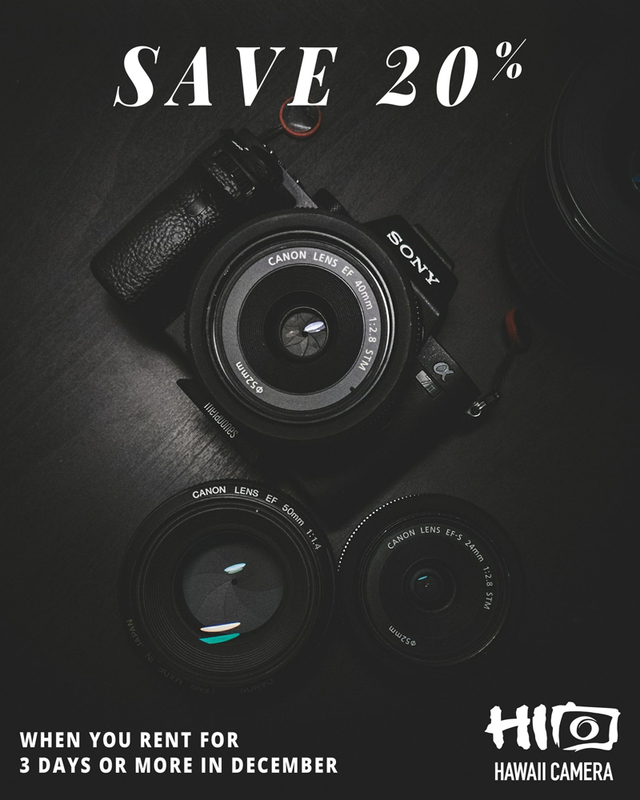 Save 20% off rentals of 3 days or more from Hawaii Camera during the month of December. Rental orders must be picked up from Hawaii Camera by end of the day (5:30 pm HST) on 12/30/2018. This offer expires 12/30/2018, 5:30 pm HST. Prices for qualifying orders will be adjusted after the order is placed. 20% discount is NOT eligible for order extensions, for shipped orders, or with/on for sale items. No cash value. This offer cannot be combined with other discount codes or be stacked. We will be closed Monday, Dec. 24 and Tuesday, Dec. 25 for Christmas. We will be closed Monday, Dec. 30 and Tuesday, Jan. 1 for the New Year.